If you’re having difficulty, we’ll discuss a little about printing requirements to help you out. Since where already at it, we might as well discuss some design idea you could easily recreate. You can even revise it to fit your own personal taste. Bleeds. There is a great possibility that print materials would be cut imperfectly. To make sure that the incidence of cutting through important details of your design, printers require that you include bleeds. Bleeds, by the way, is the allowance around your actual design. Bleeds usually is less than an inch around the design, but this will highly depend which printer you go to. Ask your favorite printer for their prescribed bleeds before actually making the design to make sure you get it right the first time. Safe Zone Area. Place all your important details within this area. There will be a specified area within the bleeds that are guaranteed safe from cutting. Business cards come in many shapes and sizes. There are rectangular, circular and square business cards. You could also find die-cut business cards like leaf-shaped, round cornered, oval and half-circle business cards. We’ll do the leaf-shaped one. Don’t worry, the process is so easy, you’ll be surprised when it ends. You might even say, “that’s it?” Well yeah, we’ll make it so simple you would want to create more designs on your own. So here we go. 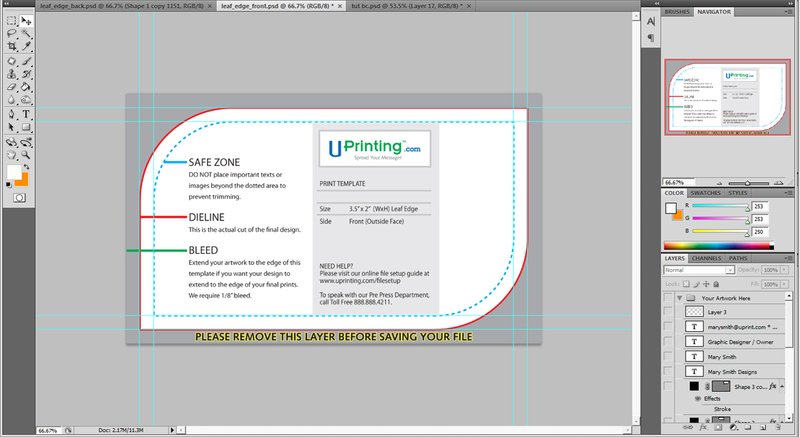 One usually starts designing business cards by creating guides for bleeds. We, however, will skip this and download a ready-made template. I went here, logged in, and downloaded the template. Hassle-free templates will make our design print-ready. Once the template has been downloaded, open both files. You should have received 2 files. One for the front and one for the back panel. We’ll start with the back panel template. Using the gradient tool, fill the background. Use #fdcb02 and #fe8e03. Step 2: Let’s make some background texture. Open the back panel first. Using the ellipse tool, create a small circle. Use white as your foreground color. Select all circles and press ctrl + e on your keyboards. Lower the opacity of this layer to 5%. Using the rectangle tool, create a rectangle across the center of the design. Rasterize this layer and, using the eraser tool (hardness: 0, opacity: 6), blur the sides gradually. Place your logo and business name at the center of the rectangle. What I did here was use the custom shape tool. Let’s fill the background with a plain color. This time, let’s use #badb01. Grab the background texture from the other panel and place it on this side. Step 6: Add shapes. Loads of them! Just kidding. Let’s add 3 long, thin rectangles with #fede03 across the design. This will serve as the foreground for our text. Using the pen tool, create a brace above the design. Use black. Using the font you like most (choose wisely, fonts can make or break your design. Here I used something simple, Myriad Pro) and type in your details. 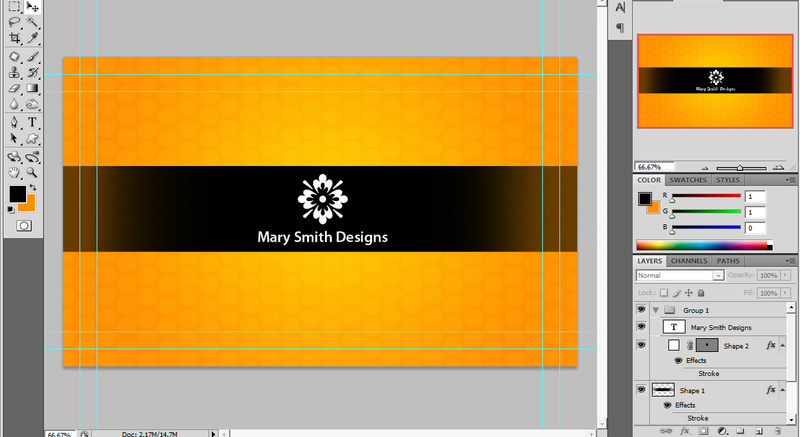 There it is, a very simple but creative business card that you can easily customize by changing the colors. You can even use your own patterns and add your own logo. Sweet, isn’t it? Try making your own version and share it with us own the comments below. You know we love hearing from you!